Happy Holidays! As you probably know, I have a male and female Eclectus that share my life. With their beautiful red and green colors, they are perfect "Christmas birds", so I always enjoy creating an assortment of Eclectus jewelry for you at this time of the year! You can find the following items on auction for the next five days: male Eclectus charm, male Eclectus charm with cell phone leash, female SI Eclectus charm, female Vos/RS Eclectus charm, male Eclectus choker, female Eclectus choker, male Eclectus pendant, female Eclectus glass beaded bracelet, male Eclectus glass beaded bracelet, and a male Eclectus glass beaded necklace/earring set. The Bird of the Month is another macaw this month, the very festive looking Greenwing Macaw! Here are the Greenwing items on auction for the next five days: bracelet charm, charm with cell phone leash, choker necklace, large pin or magnet, pendant on cord, glass beaded bracelet, and a glass beaded necklace/earring set. Please note that I have listed these with Buy It Now options! This means you can snap them up right away if no one has bid yet, without having to wait for the auction to end! Eclectus Christmas Ornament for 2009! 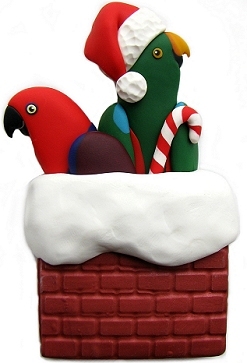 In recent years, I have started making one special OOAK (one-of-a-kind) ornament every year, featuring a male and female Eclectus. This year's Ekkies are taking over for Santa, on their way down a snow covered chimney to delivery Christmas gifts! The piece measures about 3 inches, and has a red ribbon for hanging on your tree. It is flat on the back where it is signed and dated. There is a Buy It Now option if you don't want to wait 5 days for the auction to end, but once a bid is placed, the Buy It Now option disappears!